A recent article published in 'El Comercio' [21/10/12 written by Carlos Zanabria and translated for the Bradshaw Foundation by photographer Martin Barco] highlights the potential peril of Peru's super-site Toro Muerto. 'They might be 2,500 years old, and record the history of what the ancient inhabitants of the Peruvian highlanders saw through their crossing of the Andes towards the coast. However, the area with one of the greatest concentrations of rock art in the world does not have a protection plan. The site has only one guardian who everyday rides a bicycle along the 5 kilometer route to monitor the petroglyphs scattered throughout. He says that he asked for a motorcycle but till now there is no respond to his request'. 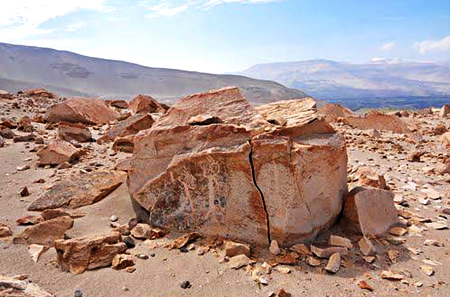 'Meanwhile, visitors and thieves disturb this cultural landscape, damage the ancient motifs or break the boulders into smaller pieces to go away with small fractions of the petroglyphs. 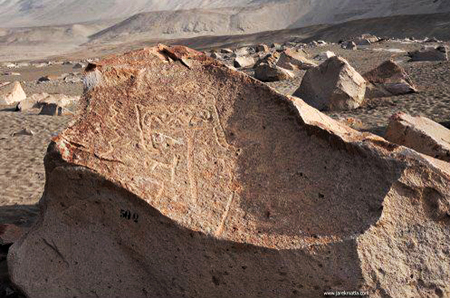 The Toro Muerto petroglyphs [translated as 'Dead Bull'], located in the Majes Valley, in the District of Corire, Castilla (Arequipa), were discovered in 1951 by archaeologist Eloy Linares Malaga. In 1982, the Toro Muerto archaeological complex was given the category of 'National Cultural Heritage'. In 1986, during the first World Rock Art Symposium held in Cuba, Toro Muerto was declared one of the world's largest rock art depositories with over 5,000 volcanic boulders featuring anthropomorphic, zoomorphic and geometric engravings. The Ministry of Culture of Peru, responsible for the preservation and enhancement of this important site, say they have neither the budget nor the personnel to protect it properly'. 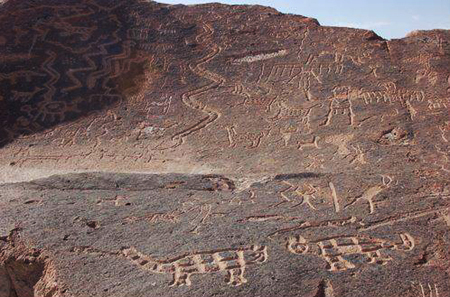 Clearly the availabilty of resources to protect such an extensive and important rock art super-site is a critical issue, and one that is not easily solved. Bringing the plight of this rock art to a wider audience may encourage further official recognition and future support.